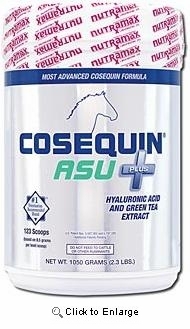 Cosequin® ASU Plus is a comprehensive joint health supplement providing the next level of joint support for horses. 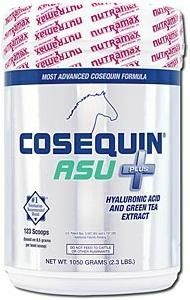 Cosequin® ASU Plus contains the same high quality ingredients as Cosequin® ASU with the addition of Hyaluronate(HA) and Green Tea Extract. The combination of these ingredients helps aid in stopping the breakdown of cartilage in horses. Regular use will help your horse move and feel better from joint pain and discomfort. 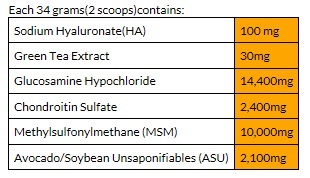 Comes in a 1050gm tub which brings a 60 day supply. The Powder is apple flavored so your horse will love it.